During the first leg of my trip I went to Singapore to work with an industrial client of ours. The first thing I noticed was that I no longer needed long pants. When compared to Maine, southern Asia is quite warm this time of year. One of the first things my colleagues had told me about a trip this far away was to give yourself some time to adjust to the time change. Considering I was now twelve hours in the future from home I took this advice seriously. Especially when travelling internationally, we want to present our best to our customers. Ensuring that I was well rested was a priority. One of the best things about working with the FlowCam is that it is incredibly user-friendly. I worked with two of our instruments while in Singapore and when performing preventative maintenance work, I was able to show the end-user some important software tricks to make their experiments easier. Singapore is an incredibly welcoming place and the people I worked with were energetic about their use of the FlowCam. I also spent a significant amount of time working in Tamil Nadu, India. I was fortunate to accompany one of our distributor groups, Spitzen Analytical, to the aquatic sciences department of Annamalai University. Here I had the wonderful opportunity to interact with many students and staff. 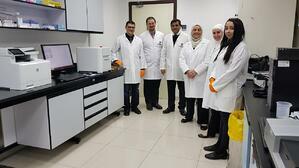 We spent almost a week in India training and optimizing methodology for their samples. Not only did we build a relationship with a customer, but we built a deeper relationship with the people that help us sell FlowCams around the world. India is a country with an incredibly vibrant and deep history, and you can see the edifices of this in every state you may visit there. I experienced so many wonderful places and people while traveling in India and my work with Fluid Imaging made it possible. I also had the opportunity to travel to the United Arab Emirates on this work trip. Specifically, I spent time in Abu Dhabi working with our distributor Nahla Medical Supplies. They were instrumental in making sure that my biopharmaceutical training and installation went smoothly. I also had the wonderful opportunity to work with NYU Abu Dhabi. This was another aquatics research group that was filled with very engaged staff and students. They intend to look at a variety of liquid samples and have decided to open up their FlowCam for the whole university to use by turning it into an imaging core instrument. This was very exciting for us at FIT as it will expose the entire research community at NYU Abu Dhabi to experience what the FlowCam can do for them. Pictured above: Stephen Barton with members of Nahla Partners and the Abu Dhabi Quality and Conformity Council.